She shore is purty is right. Redneck in a pontoon boat? Nawww, he's in a bass boat! And his kid is on a jet ski. The guy in the pontoon boat is an old duffer and his wife. They hardly ever hit anyone. Hey, I just got what Scott meant by " means he's of solid mind ". Solid rock. Good news, y'all! I started laying out the hull panels for my modified Jesse. I don't have enough 6mm ply to cut all of the panels. It's gonna rain for several days, so I can't go for more ply until it's dry. There is a supplier about an hour away. Meanwhile, I'll cut the sides and transom, and a few odds and ends. As soon as I do, I'll post a picture or two. I'm gonna raise the sheer 5 inches. That will let the cabin look in better proportion and still give me at least slouching headroom. Good Lord willin', and the crick don't rise, She'll be ready to bring to the B&B messabout in October. A heavy roof crown will also help lower the visual height off the deck. A raised foredeck (broken sheer) will do the same and help provided a lot more internal volume in the forward sections, maybe for a more comfortable V berth. PAR, I'll be doing the heavy crown, but not a raised foredeck. I have found that I rarely even sit below. I seem to be more comfortable lying down so headroom isn't a big problem. Most important is a comfortable berth. I'll be moving the aft cabin bulkhead back some to give more room forward for my fat footsies. Since I only go by myself on my little cruises, I only need sleeping room for one. The raised foredeck (like the CS-MKIII series) is a stronger way to build, if you need the elbow room, though getting the aesthetics right takes some playing with lines or they seem to come out with a funny looking angle from some points of view. The trunk cabin is traditional, though on a boat of this length, I'm (my personal opinion) generally not inclined to burden it with that much weight that high up. I'd rather go with a dodger or tent. Sleeping aboard (boats of this length) would only be done in my dreams, from the nice comfy bed, of a nearby seaside hotel, possibly with the boat still in sight from the window, as I sip morning coffee and contemplate my next day's adventures. Another positive for a raised or flush foredeck is that it adds a lot of righting moment, especially on such a small boat. The raised foredeck on the Mark3 series is a major reason they self-right so easily after a capsize. Its structurally stronger and the strength/weight ratio is better to boot. While I liked the raised deck on Summer Breeze, In general, I don't like the way they look. Especially if not proportioned right. For me, righting moment isn't even a consideration for this little power boat. PAR, if I were a reasonable person, I'd do just as you say about a motel. But, I love sleeping in a snug little cabin in a remote little gunkhole, after spending the day putzing around the little coves and streams of some remote mountain lake. There are no motels on theses lakes, anyway. sm, thanks for setting me right side up. OK, I admit it, I just like a well done flush deck boat and think they look, what is the term? "yar". Beside, I expect to take a ride in your new boat at the messabout. May as well be a boat that looks like I want it to. Get to work. Tempus is figiting. I love the raised deck look, too. But I believe Chick is still in love with his Princess Sharpie, and her traditional lines. Actually, we are not as far apart as you guys think. Even though the fore deck is not raised, the cabin sides do come out to the hull. On a bigger boat, I do prefer a walkway around the cabin. Several reasons why, with the look I prefer being one of them, but on a small boat like this, it's not practical to carry weight that far outboard to walk around the cabin anyway, and the extra room inside is preferable. Anyway, as a famous boating bard once said, "Different ships, different long splices." Do any of y'all know who said this? Oh, right. DON’T say it. I think (I can hear you giggling!) on a small boat a “regular” style house robs too much room, but I AM with Chick in that I like houses a bit more than raised flush deck, as far as looks go. Usually. The raised flush deck does evoke that “commuter” look, though, yeah? And, on some boats it just looks “right”. We all know what I mean, eh? Nothing else matters, really, as long as you paint her orange. 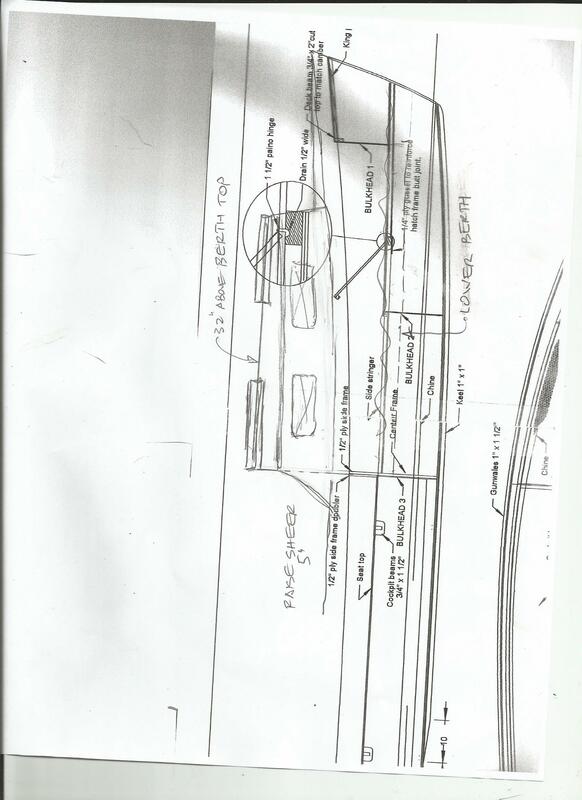 Here is a tracing of your profile with what i thought were toe rails, but Capt Pete Culler called Buffalo Rails. Without them anything on the bow is bound to DJ's locker. The sampson post is on the forward bulkhead, and the deck forward of the bulkhead could be lowered for an anchor locker. To my eye, she's not too high sided, and two tone topsides and different house side and top colors could further disguise her height. Alex, hey, I like the look. 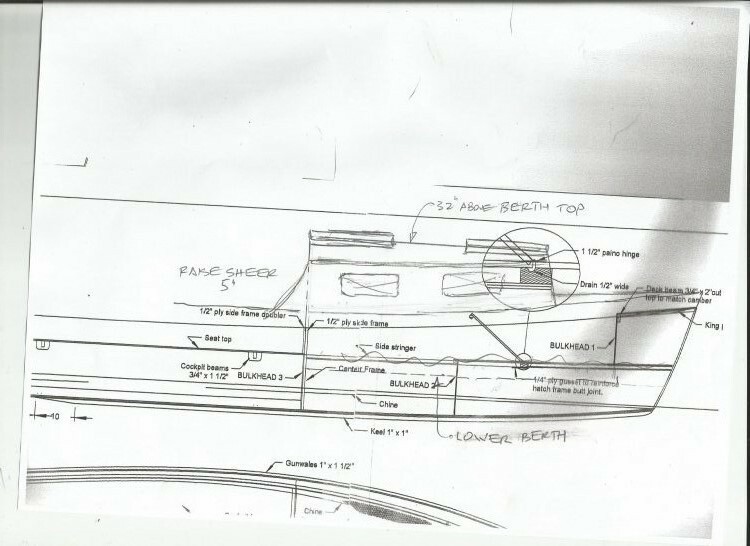 Not a toe rail, but will have a rubrail.I do plan to have the anchor-on=a-spit, and a well to drop the rode in. I'll handle it and the bow lines from the forward hatch. The bit wood look cool! Also need nav. lights on the somewhere. Gosh, Don, didn't you already say that the other day? GREAT NEWS, Y'ALL!!! Time to get along with the build! Temps in the 70s today, and no rain. A quick trip down the mountain to Greenville, SC. for several sheets of Okoume plywood. 4mm and 6mm. Miss Debbie rode along with me and we stopped for a late Valentine's lunch at the Clock restaurant. We highly recommend it. After flipping the hull upright. the seams all get glassed, then back over to glass the seams on the outside. Probably a layer of 6 oz. cloth over the whole hull. Or maybe later. Yeah, later. I'll probably be having to drill holes to wire the internal parts in place while they are being glassed. Then back over to mock up and build the interior. Dang, so much turning over. After building the interior enough to hold the shape, it will be BACK over to glass the hull, fair, prime, and paint. Then, BACK over for the last time. Whew!!! Let's see. 1-2-3-4-5 times? But then we can proceed with the rest of the build. Gonna be fun. Pull up your comfy chair, open a can of Vienna sausage, pour a tall, cold glass of real Southern sweet tea, and follow along on this latest adventure. I'm gonna post a picture just to prove to y'all that I really DID get something done today. Not much to report today. It's cold and rainy out. I did get the bottom panels cut and joined. I'm working on the transom and center temporary frame today. Gotta move this to have room for that. Then move move that to make room for this. Grrrr!!!! I need to rip out some poplar including 15ft. long pieces to stiffen the sides, but I have to leave half of it sticking out the garage door to give room to run it through the saw. Did I mention that it's raining? Still have to make the cradle, but I'm using the 2 x 4s that it will be built from to hold up my bottom and side panels out under the carport. Guess it'll wait 'til Monday. For now I'll just show y'all a picture of the panels out in the carport. You may notice the motor behind them. That's the motor that will power this boat. Turns out that it's a Johnson, not an Evinrude. Big deal, same motor with a different name! i suppose I'll have to call him Jonny. If I get anything more of interest done today. i may add another picture or two. Or not. We used to call ‘em J&E’s. Now, I hope to post this only once. And I grew up calling 'em Johnrudes. Please, Thrillsbe, do only post it once! Of course, Mercs were better. Now' y'all get the better-motor debate outa your systems so we can move along. *#////*# bad words-bad words. I had a whole mess of stuff written up, and accidentally lost it!!!!!!! Dang!!!! Oh well, here it is. Again. Here's the transom all glued up. I'll purty up the top later after it's installed in the boat. The cleats are to attach the side seat tanks, and the cleat across the bottom of the doubler will support the self bailing cockpit sole. You'll notice the deep cut motor notch. That's 'cause I'm using that 15 hp short shaft Johnson a buddy gave me. If I was gonna buy a motor, It would be a long shaft. Ok, now for the editorial. Long shaft, tiller steer motors are about impossible to come by up here in the mountain lakes. What you find here are the big, gazillion hp motors ya gotta have to catch Mr. Bass. That along with a metal---er, I mean, POLY flake competition bass boat. Ya gotta be able to go 80 mph down the lake to that goody hole. Of course the lake is only 1/2 mile wide, and 3 miles long. But, no self respecting, mountain bred, big mouth bass would even think of letting ya catch him with anything less! Unless ya bait him with Vienna sausage.